That quote, in and of itself, would be enough to hook me. I know I’m not the only one that has a simmering anxiety level over the state of our country, which can occasionally boil over into full blown panic as news cycles ebb and flow with new atrocities. Most days, the constant hum of life within my own four walls provide more than enough work to put my hands toward. However, in the daily work of raising kids, a nuanced tension within that anxiety began to nag. In a world with very conflicted and vocal opinions surrounding the role and place of gender, how were we to equip our children? They do not hold, while we wait to figure life out. The gender fluidity conversation is beyond confusing for me, and while the message for girls felt strong and grounded, fully supported and growing in momentum, there was just a void, or worse shame and condemnation asking how our boys and men were faring, because #privilege. Simply congratulating our sons on being born male is not acceptable. This book has given me a narrative, something to anchor my efforts as a mama raising 3 boys and a daughter. It confirmed my fears that men aren’t fairing well in this new world order, suicides, depression, mass shootings/hate crimes, are all on the rise. This book does not call to reverse or stall any of the progress we’re making for our daughters to assert themselves, rather its challenging us to look at the disparity in equipping we’re providing our sons, and recognizing the widespread impact that void of support is creating. Purpose Void – In a nutshell, since the dawn of man society has trained boys/men to aspire to be a warrior and/or primary breadwinner. However, while the need remains for national security, the demand is dramatically lower than even two generations prior, and with the flood of woman into the workforce, the demand for a man to prove himself as a provider has dwindled as well. The message they’re picking up: ‘We don’t need you’. Proliferation of prescriptions to address ‘inconvenient’, predominantly ‘boy’, behaviors. The message they’re picking up: ‘Something is wrong with you’. One of the most fascinating chapters for me was Chapter 16: What Dads Do Differently. It highlighted the different ways moms and dads view situations with their kids, how mom’s are more wired to protect/provide solutions, where dad’s tend to use fun/roughhousing as more natural ways of interacting. It talked about the tension this can create in marriages, as the mom’s confuse this sometimes with Dad’s simply ‘becoming another child’ for them to parent, but it explored how kids respond and the connections that form. One of the more shocking revelations I found in the book was their study disproving children are inherently better off with their mom’s in the event of separation. The key factor in that equation was an engaged father role, but with a father fighting for equal rights with his child, and the ones that were awarded majority custody, children of EVERY age (even down to infants, which shocked me) fared better when tracked through the major milestones of their lives. The main reason, fathers instill a greater sense of security WHILE challenging their children to greater levels of personal achievement. 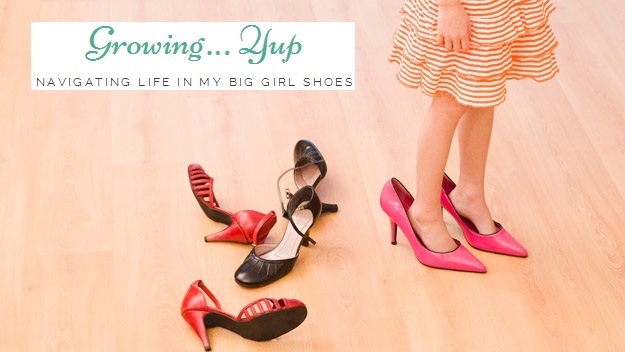 The major take-a-way I got from that portion of the book, is that for ALL the fretting I do surrounding the minutia that is raising children: Do they follow the rules, are they consuming too much sugar or electronics, do they have good friends, how much exercise they’re getting, are they getting enough sleep, reading enough, respectful…. the list goes on, and on, and on, and ON…. At the end of the day, if I keep my focus on ensuring I love my husband and we stay together…. presently my kids would be predicted to achieve at least at a 75% in key areas of mental health, school/work, future relationships. Another major focus of the book is in helping our boys bridge the chasm from heroic intelligence to health intelligence. Hero intelligence served humanity well, as we asked men to lay down their lives in service, and to aspire toward careers that were inherently dangerous: Construction, Mining, Fire Fighters, Police Force. We reinforced this with ‘social bribes’, as the book called it, family honor, greater attraction/attention from the women they sought, etc.. The shift the book calls for is empowering our boys, much as we have empowered our girls, to CHOOSE. Teaching them to assess the costs of the choices they make, rather than sacrificing themselves to try and ‘earn love’, teaching them to value themselves and what they have to offer. Teaching them to tap into the emotions, which for generations we conditioned them to ignore when we needed them to think less of the fear they might have laying down their lives, or the sadness they would feel leaving their families. Shifting toward health intelligence discusses how more and more men desire to be home spending time with their wife and kids, but as a society we gave woman choices to work full time, work part time, stay at home full-time, however for men the expectation remained work full-time, work full-time, or work full-time. It challenged us ALL, to think about how we’re driving this message. Women still expect men to pay for the 5 D’s the book highlighted: Dinner, Dates, Driving, Diamonds, (and one more I’m forgetting right now), reinforcing the message that we want them to be the primary bread-winners. The message we’re sending is we only want them for their wallets. Are we, as women, who are fighting for equality, willing to put our money where our mouth is??? Think about it. Men are not allowed to ‘expect’ really ANYTHING from women in relationship any longer, but we still expect them to pursue us, and pick up the tab in most cases along the way. One repeated quote in the book was the following, “If you follow your bliss, it’s the money you’ll miss”. It discussed how the road to ‘high pay’ is a ‘toll-road’, requiring sacrifice of time with family/hobbies/etc…. the balanced life referred to in the initial quote. It challenges us to teach our kids how to make these trade-offs, grounding their choices in the what is important to THEM, and being able to articulate that with those they choose to be in relationship with, so decisions can be collaborative rather than dictated by social expectation. This book provided lots of scenarios to read through that make you stop and think about how to teach our children to navigate through them as an adult, like the following. You have a nurturing son, kind, compassionate, that doesn’t thrive academically. Current social structures are set-up to fail him. Studies continue to prove that career oriented women as WELL as women desiring to stay at home are looking for the upwardly mobile man. How can we collectively equip our boys to identify their value in nurturing and caring for others, and have society view that as an asset rather than the stigma’s stay at home dad’s have to navigate today? How do we help our sons AND daughters see the immeasurable value men can contribute at home in raising the next generation, and facilitate open dialogue that lets BOTH sexes have choices in the family dynamics they want to set-up. The more I think about it, this ‘gender fluidity’ debate is so much less about our physical gender, than it is about the social structures we desire to operate in (stay at home dad vs. career oriented mom). Rather than promoting or castigating gender specific characteristics, what if we worked on teaching our children to articulate their hopes/dreams/desires outside of the socially normed structures, and then facilitated broadening our dialogue and understanding on how to support NEW more inclusive structures? 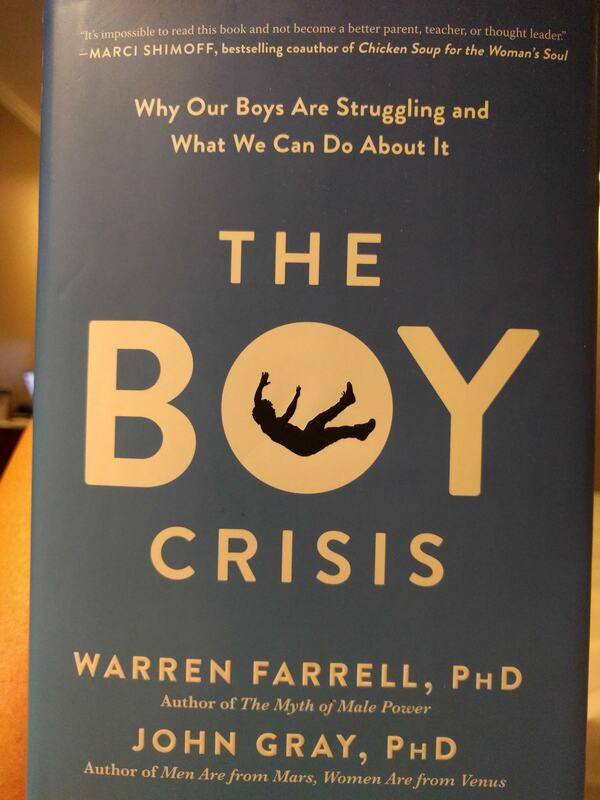 The final thing I’ll touch on is how the book talked about our view on this ‘boy crisis’ shifting from a ‘Cultural shrug’ to a ‘Cultural shift’. If people don’t care, they don’t contribute. People VERY much care about women’s rights currently, and are contributing in noticeable fashion. Men’s rights is basically a cuss word, and our boys have picked up on that point of view. We need a shift… if not for our sons, then let’s ride the momentum of our daughters…. The husbands and fathers we want for our daughters (hell… OURSELVES…. I’ve got PLENTY of girlfriends wondering where all the good guys have gone….. They’re depressed, and/or stunted, without direction or support…. the good ones are getting snapped up RIGHT quick!). We can see and feel the void of emotional intelligence, we long for connection and collaboration, as we build a life TOGETHER. We don’t want lack of communication, the #1 contributing factor for divorce…. The book corrects the misconception that divorce is about money, or kids…. its about how we’re TALKING about money and kids, to be the reason our kids marriages won’t last. Basically…. read the book….. Everyone READ. THE. BOOK. Get your husbands to READ. THE. BOOK. I truly believe once men see this stuff from themselves in black and white, it is the ‘call to arms’, direction, purpose they’ve been looking for. We DO need them, active, engaged, fighting for what matters, the future of our kids…. BOTH sexes! There is SO. MUCH. good stuff, it’s impossible to summarize it all here. I will be working on equipping MY boys, but if the rest of the world continues to ignore the issues, I will still be fighting an uphill battle. Chapter 10: Why Do More Marriages Fail in Countries That Succeed? Chapter 11: How Raising Our Sons Successfully in the Past Differs from Raising our Suns Successfully for Their Future. Specifically in this chapter, I appreciated how they pointed out the conditioning that Hollywood does, and how we can USE their influence in media and movie to have these discussions with our boys. Pointing out how if in a movie a hero dies fighting for a cause, that character is still more often than not a male character. There is a clear void (if one even exists) of a female main character hero that sacrifices her life (outside of a child-birth scenario), which reinforces that being the only ‘socially acceptable’ way for a woman to be called to ‘sacrifice’ her life. It also discusses how historically (and portrayed by Hollywood) men perform the hero’s work to attain the love of a woman/family/etc… But without the siren call for sexual fulfillment motivating women, we’re more ‘immune’ to that pressure to sacrifice ourselves.